Protecting animals from suffering sometimes requires us to loudly champion and defend our ideas - especially to local leaders. One of the best examples is the practice of trap-neuter-return (TNR). TNR - which involves humanely trapping feral cats, having them sterilized and vaccinated against Rabies, and returning them to their colonies - is the only humane method to stabilize and reduce community cat populations. Spayed and neutered cats also make less noise, spray less and have a reduced risk of getting cancer. And because spayed female cats don't go into heat, they attract fewer male cats to the area. That's why we're putting our full weight behind A.2778, an NY State bill authorizing critical state funding for TNR programs. State legislators decisively passed the bill this summer and recently delivered it to Governor Cuomo, who has until Monday, Oct. 26, to sign it. 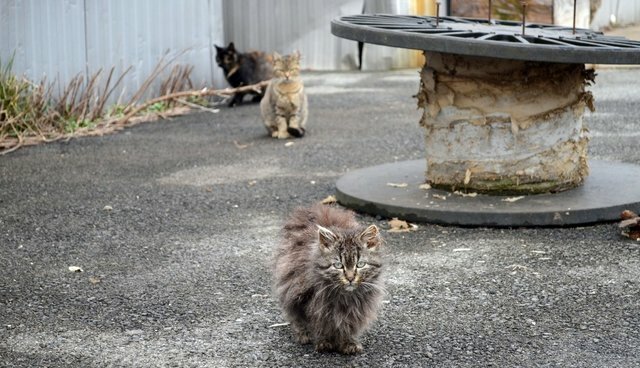 The measure faces strong opposition from powerful but misguided groups that would prefer community cats be rounded up and euthanized, despite evidence showing this approach is ineffective, not to mention inhumane. Systematically euthanizing community cats only adds to an already perilous situation for adult cats, who generally are euthanized more often than any other type of cat or dog. To counter the forces aligned against this bill, A.2778 needs equally strong and supportive voices representing thousands of vulnerable community cats and kittens across the state. And actions today can have future impact: when TNR funding is approved in one community, it increases awareness and consideration in others. Communities, legislators, and even celebrities are working right now to turn TNR awareness into life-saving action. If you live in New York, please consider joining them. 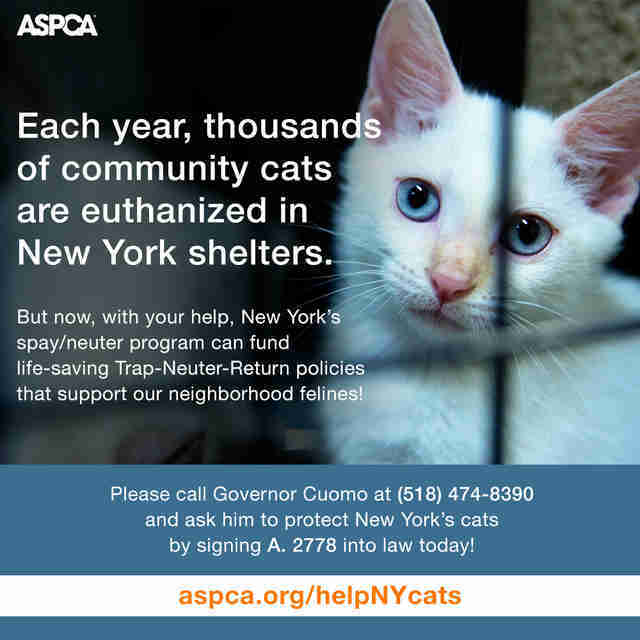 Contact Governor Cuomo at (518) 474-8390 and politely ask him to sign A.2778 for the sake of innocent and imperiled cats who deserve our care and protection.